Arena Helper is a plugin for Hearthstone Deck Tracker that helps drafting Hearthstone arena decks. Hearthstone is a popular free-to-play card game by Blizzard Entertainment. The game has a game mode called Arena. In the Arena mode, the player has to create a deck consisting of 30 cards. The cards are picked one at a time, so there are 30 choices the player has to make. Every choice consists of selecting one card out of three randomly selected cards. Not every card that is presented, is equally good as the others. New players, but even experienced players, don’t always know which card has the most value. This plugin helps the player to make a choice, by showing what other expert players think of the value of the presented cards. 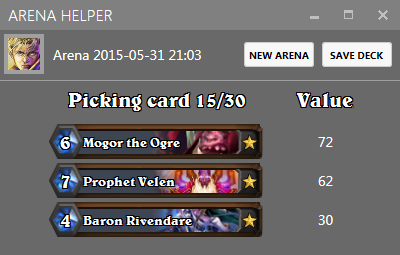 The plugin tries to visually detect the arena heroes and card choices. Detected cards are displayed alongside the value of the card, that is specified in ADWCTA’s Arena Tier List. The created deck can be saved to Hearthstone Deck Tracker. The plugin uses perceptual hashing to detect the Hearthstone arena heroes and cards. The plugin uses OpenCV, or rather Emgu CV, to calculate the perceptual hash. It was written using C#, because Hearthstone Deck Tracker uses it. This article explains how the plugin works and provides code examples to implement your own image recognition algorithms based on perceptual hashing. For the latest news, releases and downloads, visit the Arena Helper project page on GitHub. The rest of this article explains the technical details of the plugin. The plugin takes screenshots of the Hearthstone window and uses this visual information to detect game states, cards and heroes. The plugin doesn’t use memory reading functions and it doesn’t inject data or code into the Hearthstone process. Lets say we have a hashing function that takes an image and returns a 64-bit number that represents the image. Two different images will result in two different hash numbers. If we have two images that are almost the same, the two hashes will also be almost the same. So we can use the hashing function to compare two images and find out how similar they are. If we know the exact position of the visual elements we want to detect, and we know what the visual hashes of these elements should be, we can try to detect them. This requires us to precompute all of the perceptual hashes that we want to detect. 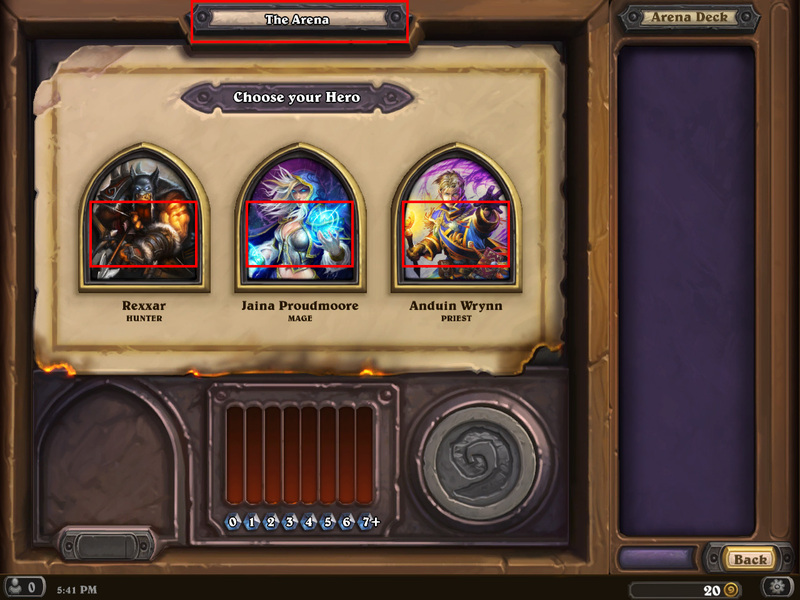 The image below shows how Arena Helper tries to detect the Hearthstone game state and the heroes. The red rectangles indicate the location of the visual elements we want to detect. These locations are defined in the code of the plugin and the visual hashes of the elements are precomputed and stored in a database. The image in the top rectangle shows us if we are in the arena state. The bottom rectangles represent the position and size of the heroes. The visual hashes of the three heroes are calculated and the hashes are matched against the hashes stored in the database. If the hashes are close enough, we have detected the heroes. Detecting cards is a similar process. We define the exact location and size of the visual elements in the code of Arena Helper. This information is only correct for a specific resolution. If the resolution is changed, we need to convert our stored locations to be compatible with the new resolution. For example, we can define a rectangle that indicates the location and size of the first hero portrait in the image above. The code examples below will be using C#. This rectangle is correct for the reference resolution of 1280 x 960. If the game runs in a more standard resolution like 1920 x 1080, we need to convert the location and size of the rectangle. It depends on the game how the visual elements change when the resolution changes, but for Hearthstone, the following conversion functions work most of the time. If the resolution is extremely wide, the conversion function will not work. To convert the portrait rectangle, we can use the functions as follows. Now that we have the converted rectangle in the form of pos and size, we can copy the rectangle from a screenshot of the Hearthstone window and calculate the perceptual hash. The perceptual hashing function uses the techniques from Looks Like It. The implementation was done in C#, using the Emgu CV library that is a wrapper for the OpenCV library. The code below is compatible with Emgu version: Emgu.CV-3.0.0-rc1. The GetImageHash function takes a bitmap and returns a 64 bit perceptual hash. To calculate the distance between two hashes we create the GetHashDistance function. This function calculates how many bits are different when looking at two hashes. Now that we have the GetImageHash and GetHashDistance functions, we have all the tools we need to recognize images, visual elements, that are embedded in a screenshot. Arena Helper integrates with the overlay system of Hearthstone Deck Tracker. 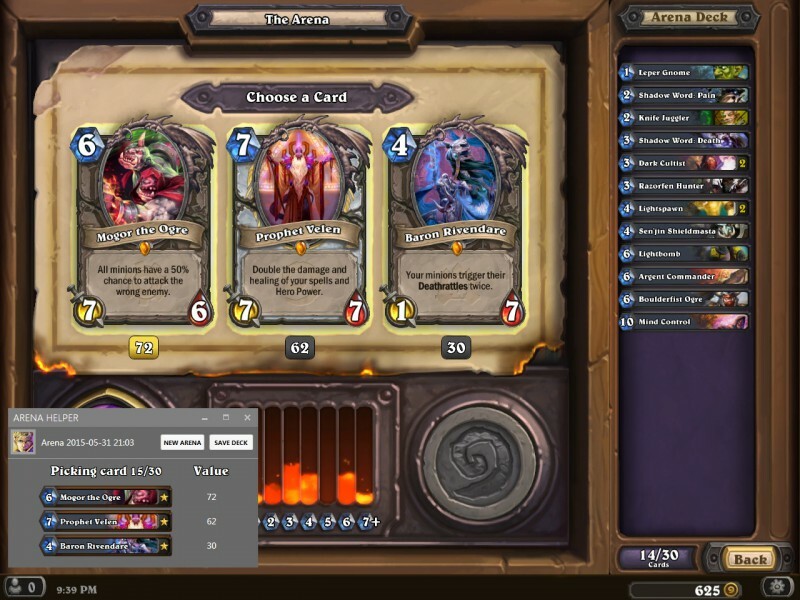 It displays the values of the cards under the actual cards in the Hearthstone window, just like how Hearthstone Deck Tracker does it. The image below shows the Arena Helper overlay. For the latest news and releases, visit the Arena Helper on GitHub project page. The latest release of the plugin is always available for download at the Arena Helper releases page.